Without hesitation, I admit that I do not enjoy most musicals. In fact, when someone starts to talk about a musical (or worse tries to invite me to one), I roll my eyes and wonder why anyone in their right mind would want to see a musical. But of course, everyone has their own preferences and I try to respect that. 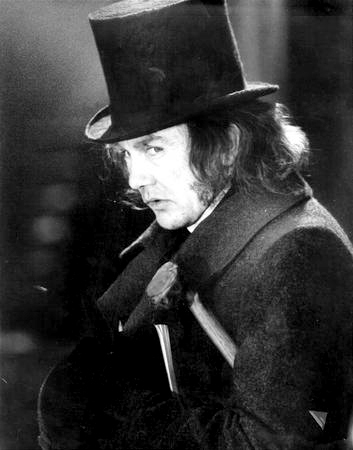 That said, as much as I would like to say that I don't like any musicals, I cannot deny the fact that Director Ronald Neame's Scrooge is an incredible piece of art. So much so that for nearly my entire life, I've watched this film every holiday season. It started when I was very young when they broadcasted it on television and then on DVD when it was finally released in the 90s. Now, I'm happy to say that it's available on Bluray. 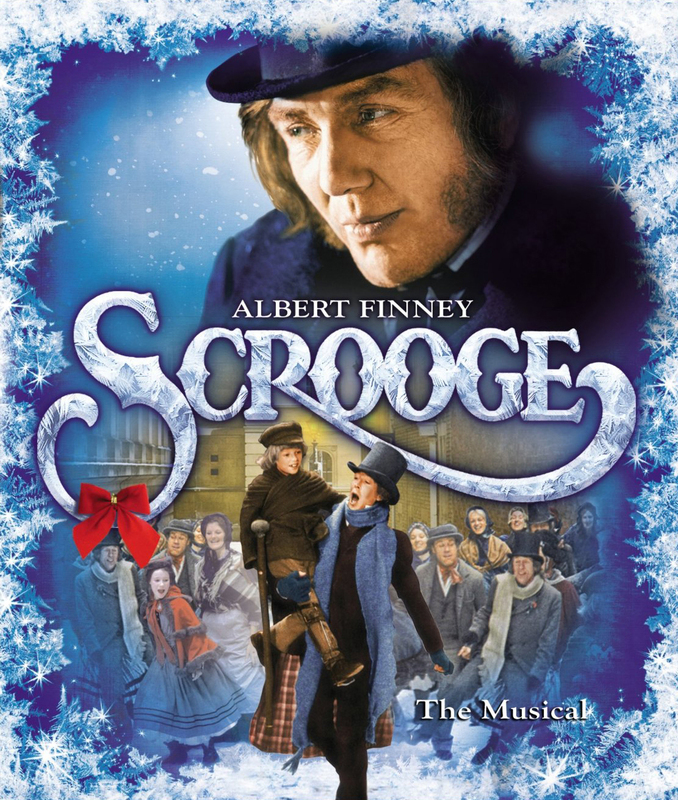 The great Albert Finney who has starred in such films as Big Fish, Annie, and Miller's Crossing, stars as the grouchy Ebenezer Scrooge. At one point or another just about everyone has seen an adaptation of Charles Dickens' classic novella "A Christmas Carol". Finney leads this version of the tale and absolutely dominates the role. Transforming from young and old versions of Scrooge, Finney fooled me until I was a young man - I actually thought it was two separate actors. I feel silly, of course, now that I watch it but it goes to show how well Finney transformed himself from a handsome, young man enamored with a young beautiful woman to an old, money-obsessed miser. Albert Finney as "Ebenezer Scrooge"
And Finney wasn't alone; his supporting cast amazes even after seeing the film dozens of times. From David Collings's portrayal of Bob Cratchit to Kenneth More's Ghost of Christmas Present, the players in this production fill the screen with fear, sorrow and joy. 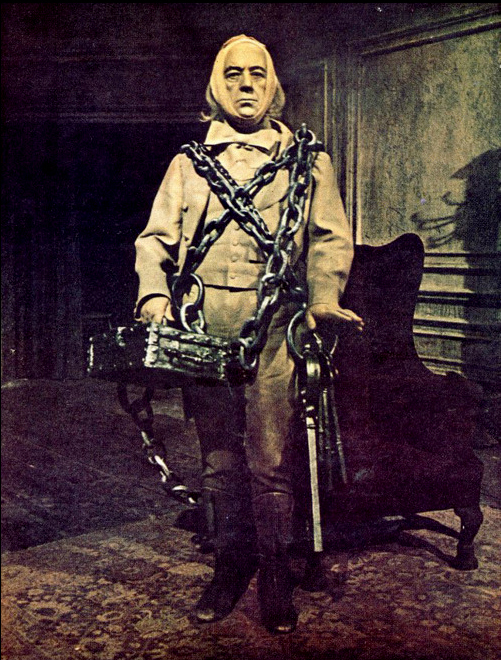 And of course there's Sir Alec Guinness' delightful portrayal of Jacob Marley's Ghost. He's clearly having fun with such a frightful character. Anyone who's seen the film remembers the comical yet terrifying manner in which Mr. Guinness floats around the room. Sadly, he's mostly remembered as his Obi-Wan Kenobi character in the original Star Wars trilogy. But take a look at the body of his work (www.imdb.com/name/nm0000027) and you'll be amazed by all of his accomplishments including his role as George Smiley in the mini series Tinker, Tailor, Soldier, Spy (the film that sees Gary Oldman as Smiley in the 2011 remake: www.imdb.com/title/tt1340800). Sir Alec Guinness as "Jacob Marley's Ghost"
Besides the astounding acting, Scrooge is in fact a musical and I couldn't skip over the fact that the compositions in this film are just as joyous and heartbreaking as the performances. Leslie Bricusse (along with Ian Fraser and Herbert W. Spencer) is the genius behind the Oscar-nominated music. He also takes on screenwriting duties. Nominated for "Best Original Song" and "Best Score", Bricusse weaves between elation and gloom. Comparing "I Like Life" a blissful version of its counterpart "I Hate People", shows off the composer's use of light and dark themes. "You...You," sung by Finney, is full of heartache and regret and again shows how sadness can also be interpreted into love. Bricusse also ventures into extreme darkness with the song "Thank You Very Much", the film's most famous tune. It's a seemingly happy tune but in the context of the film, the song is more than a bit macabre. Scrooge was also nominated for "Best Art Direction" and "Costume Design". 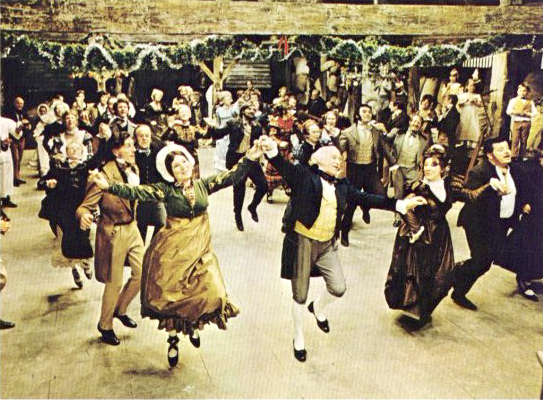 The film is full of both warmth and bitter coldness, from Scrooge's dreary black surroundings and outfits to the Ghost of Christmas Present's vibrant colors. But no scene showcases the costumes better than during the musical performance with Laurence Naismith as the cheery Mr. Fezziwig. 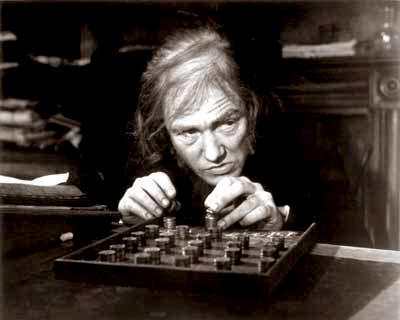 Laurence Naismith as "Mr. Fezziwig"
Fezziwig's scene is also a great example of the Bricusse's music with the song "December the Twenty-Fifth". It's both catchy and fun which help compliment Scrooge's feeling of remorse. It's also a turning point for the character, which is fitting as it's a "birth" of a new life to be. As a person who shudders at the thought of watching a musical, Scrooge is the exception. For those of you who stay clear of musicals, you have hope. And for those of you who already enjoy them, then prepare yourself for the best holiday treat of the year. It's a classic tale told in a very classic manner. TRIVIA: Alec Guinness' big musical number was cut from the film, although the lead-in remains intact. It was called "Make the Most of This Life."